There was no sleep Thursday night in my global network, as it became increasingly clear the UK had voted to leave the EU. Major moves are underway in the global energy sector as players attempt to wrestle with what may be the biggest single event to jolt markets in decades. Some 80 years ago a mainstay of the Greenwich Village literary scene coined a phrase that has been with us ever since. Gertrude Stein traveled from New York to Oakland. Upon her return from the West Coast, somebody asked for her reaction. "There's no there there," was Stein's response. What unfolded overnight Thursday is like walking off a cliff and hoping for the best. It likewise demonstrates why one should never play politics with contentious issues unless you control the outcome, a lesson the British prime minister has learned too late. First, David Cameron announced he will be stepping down as British prime minister and new elections will be called (probably for early fall). Third, this may be the first of several "shoes to fall." The Spanish parliamentary election this weekend will provide us the initial read on similar views elsewhere in the EU. My contacts now expect Ireland, Portugal, and even the Netherlands to experience similar exit pressures. Fourth, Friday morning Spain fired the first salvo. It is now demanding control over Gibraltar – the UK's exclave at the southern tip of Spain – in the wake of the British departure from the EU. Fifth, the Bank of England has promised "unlimited" liquidity support for the British pound sterling after it collapsed worse than at any time over the last three decades. Nonetheless, the currency will be under pressure for some time and that will have a toll to exact from the British economy. Sixth, hundreds of thousands of trade, investment, business, banking, and fiduciary arrangements are now in limbo… as are hundreds of thousands of jobs. Oh yes, Daesh (the name for ISIS that the group itself hates) issued a statement applauding the "death of Europe." This time around, on the other hand, it could not find a way to claim responsibility. Other ducks will be falling shortly. Markets throughout the world are awash in tidal waves of red ink. The dollar and U.S. fixed instruments (bonds) are once again becoming a "safe haven" for international investors. Both WTI (West Texas Intermediate) and Brent, the two leading international benchmarks for oil trading, posted 5% losses in overnight markets last week. The losses have since leveled off. On the plus side, global demand is increasing and supply balance is taking shape. But the volatility spawned by the UK exit vote will provide some hefty headwinds for oil in the short term. The vote has also done major, perhaps fatal, damage to "The City" (London's financial district) and its position as the world's preferred location to raise energy project capital. For years more money has been raised for energy projects within a radius of two miles from Liverpool Station and St. Paul's than anywhere on earth. 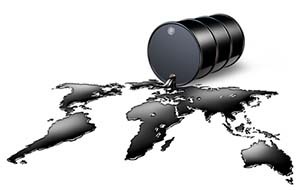 Oil will stabilize well in advance of the global market as a whole. Gold may be the initial beneficiary of Brexit. But, as I have discussed in the past, crude oil will progressively become the non-currency "store of value" moving forward. The good news is that, as the situation stabilizes over the next several weeks, the American market will be seen as a "safe haven" and is going to be the center of an investment feeding frenzy.